Mail the publisher at info-at-drenthpublishing.nl for more information and to order the book. See contact details for further information on ordering. In 1712, more than a decade after the start of the conflict over the inheritance of the Spanish realm, the British Army consisted of more than 110 regiments of horse, dragoons and foot. With the end of the war in 1713, that number was reduced to about 50 regiments by early 1714. The strength of regiments kept on the establishment was much reduced as well. Because of these reductions, a large number of officers became supernumerary to the establishment. A list of these reduced officers, who were eligible for half-pay as a means of financial support, was presented to the House of Commons in April 1714. This list shows for each regiment, disbanded and still on the establishment, the officers reduced with their rank. 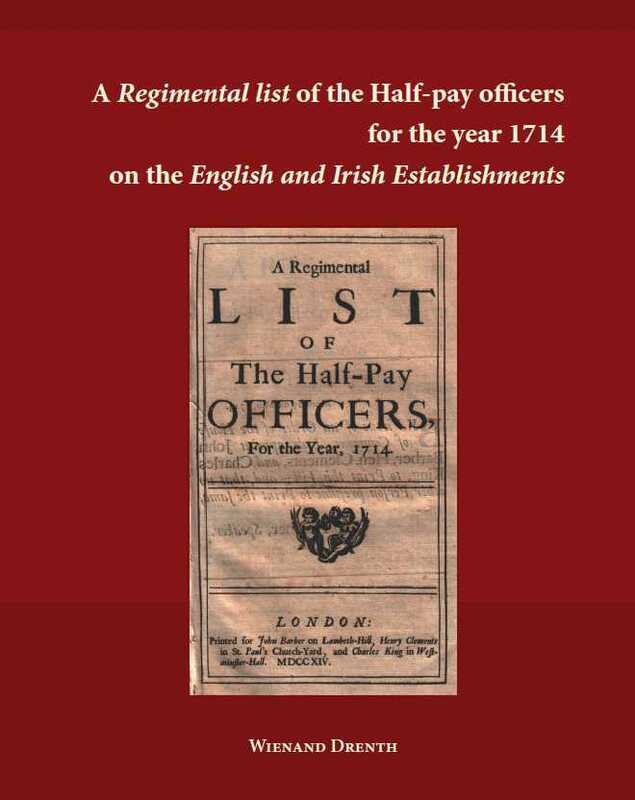 Though this list gives the officers reduced to English half-pay only, it presents a valuable insight in the mechanism of army reductions in the early 18th century. Many new regiments were raised during the summer of 1715, and most of the officers were taken from the half-pay list. This list is, therefore, also important as documentation of the army between the Stuart and the Georgian period. This publication sets forth to reproduce the 1714 regimental half-pay list in the first place. Officers reduced to Irish half-pay have been added to give a fullest possible account of the reductions of Britain's armed forces after the war. Short regimental narratives with a succession of regimental colonels are provided for each regiment. Altogether, over one-hundred regiments are detailed, with the names of more than 2,500 officers. Lists of regiments at specific events during the war are provided to complement the narratives. A variety of appendices is given as well, with background information on topics such as precedence and rates of half-pay.